Simply put, we believe that no one is more qualified to support value-based healthcare than Modernizing Medicine®. So we’ve rolled out a concierge-style program that gives our EMA™ clients access to our MIPS specialists, helping you achieve MIPS success. How effective is our program? Under MIPS and MACRA, your Medicare reimbursements depend on your ability to show quality of care based on performance compared to your peers. As a proven performer in supporting value-based care for specialty physicians, Modernizing Medicine has your back with powerful MIPS tools. Our Advisory Services provide the final piece of the puzzle: personal guidance from a MIPS Advisor who is also trained in EMA. Using our specialty-specific, 2015 Edition Certified EHR system, EMA, you can easily collect your MIPS data and view a real-time scorecard that shows your progress on each measure. From there, your personal MIPS Advisor can give you guidance on how to meet your MIPS goals. The result? Peace of mind. Did you know the QPP final rule outlining the 2019 MIPS requirements is 2,378 pages long? And with CMS rolling out additional changes to the program each year, it’s difficult for you and your staff to keep up with every aspect of the regulations. Our MIPS Advisors have been trained on MIPS, so you can focus on your patients. They’ll work with you to build your practice’s custom MIPS project plan and answer your questions along the way. Modernizing Medicine’s MIPS Advisors understand the measures that matter most to your specialty and how to help your practice meet them. Unlike outside consultants who can only provide generic advice, our MIPS Advisors can actually walk you through how to document each MIPS measure in our EMA EHR system. Plus, the next time a new MIPS feature or shortcut is rolled out in EMA, our MIPS Advisors can make sure you know how to use it effectively. With our MIPS Advisory Service options, you’ll get a MIPS Advisor who knows both your EMR and your practice. They’ll monitor your performance so that they can alert you if there’s something specific you should change in your workflow to improve your score before it’s too late. It’s almost like having them right there in your office! 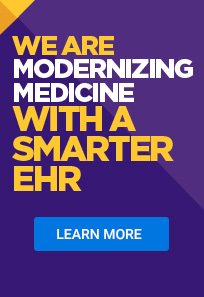 Modernizing Medicine helped us improve our bottom line due to their amazing MIPS support. Our MIPS Advisor has helped us not only meet the minimum guidelines, but also receive incentives for all of our providers! The reporting clearly shows where you’re performing well and where you can improve. It’s extremely comprehensive and easy to follow. Reserve your MIPS Advisor today!